Charitable organizations throughout the Phoenix area depend on volunteers to help them provide vital services for their communities. If you are interested in helping out during the holidays you have many different opportunities to volunteer with health, educational, and arts organizations, as well as recreational groups, and, of course, groups serving less fortunate members of the community. Whether you're interested in volunteering on your own during Thanksgiving and Christmas, your family wants to do something worthwhile, or a group from work or school wants to get together and do something nice for others, giving back with your time is a selfless and rewarding way to offer assistance to those in need. It's important to remember that these charitable organizations across Phoenix can always benefit from your time and generosity during the holidays, but also all year long. If you intend to bring children or teenagers, double check with each organization ahead of time to make sure that minors are permitted on the premises. 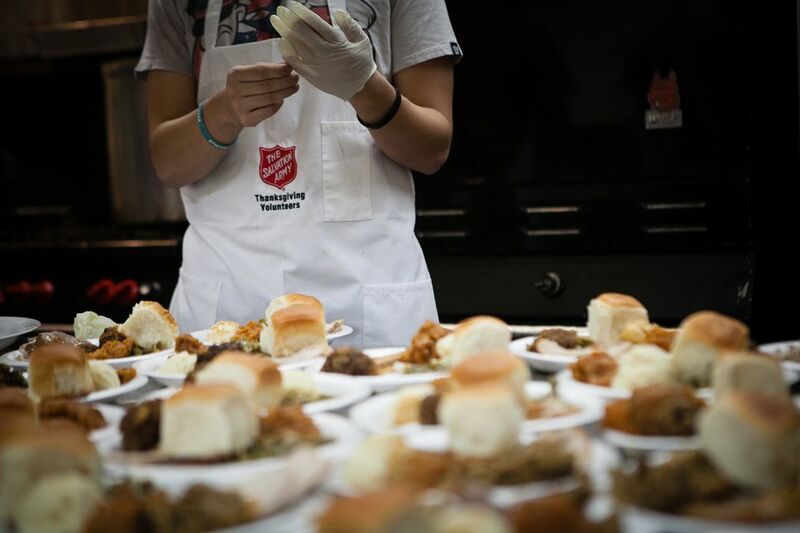 Each holiday season, The Salvation Army provides thousands of meals for needy families across the Valley of the Sun. With the help of hundreds of volunteers, traditional Thanksgiving and Christmas dinners are served to all who attend and are home-delivered to home-bound individuals. Volunteers are always needed to set up, serve, clean, and usher at Thanksgiving and Christmas dinners, and to deliver holiday meals to families, the elderly, and shut-ins. There are also opportunities to help out at the Christmas Angel Toy Drive by distributing gifts to families, but please note that volunteer stops for this event fill up fast. Children under 18 are allowed to volunteer with the Salvation Army if accompanied by an adult. There are three locations in the Phoenix area that are open to volunteers. St. Mary’s Food Bank Alliance strives to raise awareness of the realities of hunger and poverty hiding in plain sight. Volunteers are essential to St. Mary’s Food Bank Alliance operations, and assist in a number of tasks including sorting, boxing, and bagging food items, providing administrative and fundraising support, and acting as community advocates and ambassadors to bring about positive change. The food bank is closed on Christmas Day, but their biggest need for volunteers is immediately after the holiday and in early January when all the food collected from the local food drive must be sorted and packed. Individuals, families, small groups, large corporate groups, and students completing community service are invited to volunteer. The main warehouse is located at 31st Avenue and Thomas Road in Phoenix. Established in 1983, the United Food Bank began operation in nearby Mesa, Arizona. The organization's mission is to provide access to healthy foods to those who are lacking proper nutrition and serving as a community bridge between those who want to help, and those who are in need. United Food Bank defines its work as 'Neighbors Helping Neighbors.'" There are many volunteer opportunities open to both individual and larger groups, as a one-time event or on a regular basis. Each year, The Society of St. Vincent de Paul moves over 10 million pounds of food through its food bank, helps thousands of homeless people get off the street, and prepares over one million hot meals for the hungry. During the holidays, the society utilizes many short-term volunteers to prepare and serve meals, and work on clean up after the meals are distributed. There are volunteer opportunities here for all ages, including young children. If you have an affinity for wrapping presents, A Place to Call Home seeks volunteers each holiday season to help wrap gifts donated by the community to give to foster families across the region. There are many more volunteer opportunities throughout the year that are listed on HandsOn Greater Phoenix (formerly known as Make a Difference). You can search for volunteer requests by region, date, or community impact. Youth volunteer opportunities, in addition to requests for adults, are also included. There are also other ways in which you can help. If you are fortunate enough to be able to provide monetary assistance, you can always adopt a needy family, and provide toys and other gifts for children who otherwise might not receive any. You can also organize a food drive in your neighborhood or at your workplace or school, and ask for donations of non-perishable foods or specialty holiday items such as turkeys. If you are interested in any of these individual ways to help, contact the organization of your choice, and they can point you in the right direction for organizing those types of activities. Fun Ways to Volunteer for the Holidays in Washington, D.C.